There are three steps in making this Apple Kuchen recipe. Even though there are three steps, none are difficult and the end result will leave you with a delicious 8 x 8 apple dessert. You can make the cream cheese topping for the apple kuchen or serve apple kuchen with cinnamon ice cream, my favorite way to eat an apple kuchen or any apple dessert for that matter. For the best results when making apple kuchen of any apple dessert recipe, I personally like to use at least two different kinds of apples. I feel that using two kinds of apples or even three or four different kinds of apples, adds so much more flavor and texture. Another thing I like to add if possible is a handful of fresh or frozen cranberries which give apple desserts a tart, sweet flavor. Thinly sliced pears are another option too consider. Kuchen [KOO-khehn] is a fruit or cheese-filled yeast-raised cake, usually served for breakfast but also enjoyed as a dessert. It originated in Germany but is now enjoyed in many variations throughout much of Europe and the United States. The word Kaffeekuchen is German for “coffee cake.” A kuchen tends to be less sweet than what we know as a “coffee cake” with the emphasis on the fruit. So then, what is a coffee cake? This rich, sweet, cake-like bread is usually eaten for breakfast or brunch. Coffee Cakes can be made with yeast, but those using baking soda or baking powder take less time and are equally delicious. Coffee Cakes can contain fruit, nuts and sometimes a cream cheese filling. They can be frosted or not and are usually best served slightly warm. Apple Kuchen with Cream Cheese Topping is a real apple treat. Combine the flour and brown sugar in a bowl. Cut in butter using a pastry blender until mixture resembles coarse crumbs. Set aside. Grease an 8 x 8 inch square pan. Set aside. Combine 1/2 cup flour and the yeast. Heat the milk, sugar, butter and salt in a small saucepan. Heat until mixture reaches 120 º to 130 º F. Add the heated mixture and egg to the flour mixture. Beat on low to combine. Beat on high for 2 minutes, until mixture is smooth. Using a dough whisk or wooden spoon, add the remaining flour to create a stiff batter. Spread batter in prepared pan. In a medium bowl, combine apples, brown sugar, tapioca, lemon juice and apple pie spice. Toss to coat apples. Spread apple mixture on top of the cake batter, then top apples with crumb topping. Allow to rise for one hour in a warm place. 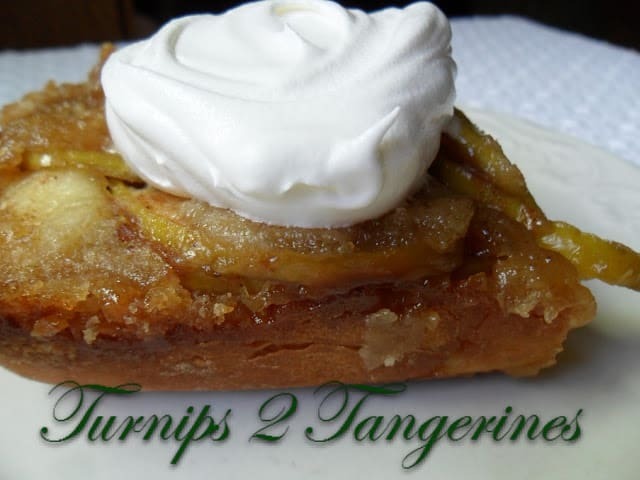 Preheat oven to 375 º F. Bake for 30 minutes or until top is browned and the apples are cooked through. Cool on rack for 30 minutes. Beat in the remaining ingredients until creamy. 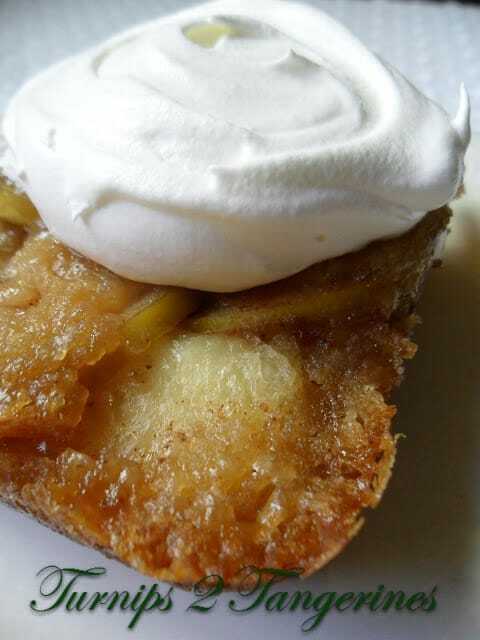 Serve cream cheese topping with apple kuchen. Welcome to SRC. I love apples but have never made a Kuchen before – it looks really good. Great SRC pick. Happy belated reveal day! Thank you and Thanks for stopping! Ah, I can't wait to go apple picking so I can make this cake!! It sounds amazing and perfect for fall. Great choice! Hi Lynn, another interesting recipe. The topping look so good. Thanks for sharing the SRC link. Everything look awesome! I know exactly how you feel. When I got the email from April asking if I still wanted to join, the composed, adult in me responded, "yes, that would be great". The kid and foodie and me jumped up and down with excitement–"I'm in! They like me!" A beautiful apple dessert. I'm sure I'll be coming how with a few bushels in a few weeks. This is a recipe to save. Welcome to SRC! It's a great group of ladies and a great place to go to whenever you have any questions about blogging or food 🙂 This apple kuchen looks fabulous..great SRC pick! Welcome to the SRC! What a great choice for your first SRC post – YUM! Glad to meet another WI blogger! I can't wait for apple season! What a beautiful kuchen! There are a lot of newbies, me included. The recipe you choose from Karen's blog is so great Lyn, I just love crumb kuchen, and with apples too! Hi Paula~ There are alot of newbies:) One of my favorite things is a crumb topping, on anything! Welcome to SRC! Looks delicious! Thanks for joining us this week at the Let's Get Social Sunday party. have a wonderful week! Hi Melissa~ Thank-you for the Welcome! Welcome to SRC!!! I loved going through your blog this month and have bookmarked so many things I want to make, but first I might have to make another batch of your peanut butter cookies. And this apple kuchen is perfect as we roll into fall !!!! Thanks so much for stopping by~ This has been a great first reveal day!! Welcome to the club! I love the title of your blog. Too cute! Welcome to SRC!! This was a great first pick, it looks delicious! Can't wait til I have crisp Fall apples! Such a great looking recipe! It would be perfect with vanilla ice cream. Great SRC pick! What a beautiful recipe you chose. Oh my – that looks SO good! Fantastic SRC pick!! My husband would LOVE this! The pictures are just gorgeous! Happy first reveal day! This looks and sounds delicious! Love the combination of cardamom, ginger and nutmeg. YUM! Hi Renee~ Thank you! I love using Apple pie spice and Pumpkin pie spice, it gives a recipe that extra hmm? This sounds like a perfect recipe for apple season! Great choice for SRC this month!! Oh My!! This really looks delicious!! This would be a great addition to Thanksgiving dinner!! Hey thanks! I've been following you for a while and love your blog. Glad to meet you!